olusola akinseye's studio journal: Recent Event: At Last, An Artist In Space! Recent Event: At Last, An Artist In Space! I was delighted to read about Karen Nyberg, a NASA Astronaut making plans to create a piece of art at the International Space Station. 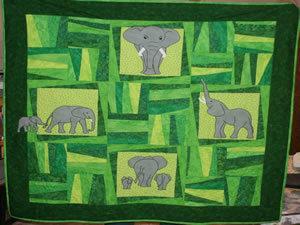 The work-of-art in question is quilting- the stitching craft involving use of decorative designs. Below is a quilt earlier made by Karen Nyberg. "I enjoy sewing and quilting," she explained during a televised interview from Moscow. "I am bringing some fabric with me, and thread. I'm hoping to create something. I don't know what yet it will be — that's part of creativity. It comes with the feeling of the day. So I have the supplies at my hands to create, if I get the opportunity and the creative notion to do so." Granted, this 'artist' is a fully trained Mechanical Engineer but I'm really looking forward to seeing the first work of art created in space. Best of luck to Ms. Nyberg!